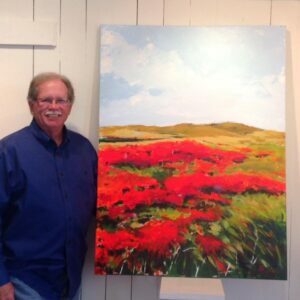 Bob Neace is an All-American artist. His passions include baseball, American history, the great outdoors, and he’s still running Bob Neace Graphic Design after 36 years. The last paintings Bob executed were for his senior painting class at WSU in 1973. Beginning anew in August of 2012, his acrylic paintings represent his simple desire to create images that might just for a moment take you back to a time and place that is meaningful. The brush strokes accumulate, and truth becomes beauty. The twinned halves of his paintings speak back and forth, and beauty becomes truth. He paints once more. The weather of his heart leans into the wind –which tells him, and us, not much. Not much at all. But then again, all we need to know. Following a recent desire to break away from what has been a relatively successful style, Bob began searching for a different way to apply his acrylics. Galleries were telling him that they already had artists that painted like he painted. So he stepped out further and began applying the paint with a credit card. It seemed a better use for the plastic slab in the hands of a collector of baseball relics. And cheaper. The result is a series of paintings he calls “Landscrapes.” He scrapes the paint on the canvas and then scrapes it off. Over and over again, layers and layers, scraped on and scraped off until it’s right. Bob thinks that the old masters would frown a bit at the end result. But then, who cares what they think, he states. He does what he likes –always has, always will.